Following the subtle statement furniture, next up was some new framed art. Generally I am not much of an art lover in the original sense; where I carefully curate my next purchase, keeping in mind its potential (future) value both in a monetary sense as well as status. For me it's much more spontaneous and less thought-out. Something either speaks to me... or it does not. I couldn't care less whether it's deemed a historical master piece or if it's a poster created by a stranger on Etsy: I like what I like and I don't think that will ever change (I have tried to be more "artsy intellectual" - fail). It's not that I do not appreciate the knowledge and point of view that some other people have, but to me art is an emotional, illogical thing that doesn't need to be completely dissected or analyzed to be understood. It's whatever the observer wants to make of it... love it or hate it. 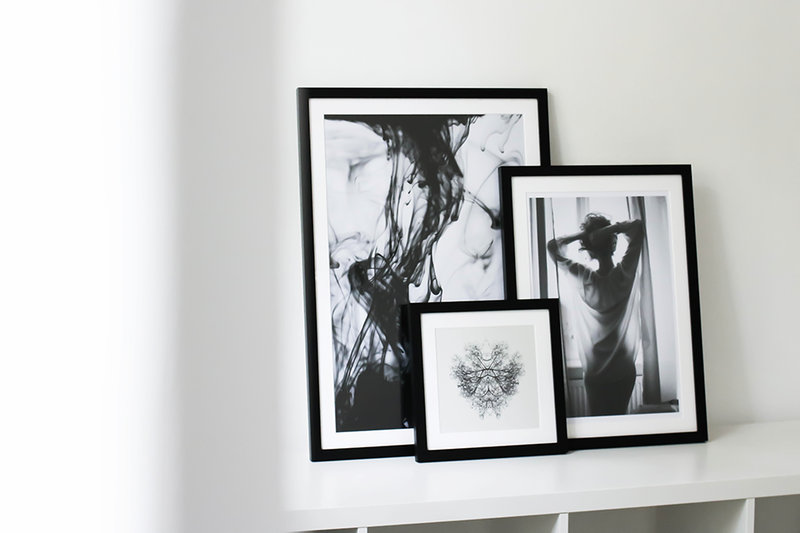 So for the next step in decorating my new home I wanted to find a few framed pieces that wouldn't just tie things together in the styling, but also maybe spark a conversation. With only this idea and not a concrete picture (ha) in mind of what I was exactly looking for, I just started browsing and took note of those pieces that immediately caught my attention. (Which is by the way the perfect way to make decisions when you're feeling overwhelmed by a large amount of options). Knowing that Berlin-based JUNIQE offers a large collection of affordable art from all around the world, I went straight to them to find (out) what I was looking for. The only requirements I did have: black & white, photography, not too cookie-cutter. The framed artwork I ended up choosing (no easy task!) check all those boxes and perfectly capture my "interior mood". I feel like they catch your eye and you want to keep looking, studying them for a while, to see what's actually in the picture. I wouldn't be able to pick a favourite out of the three - a few weeks later I am still super happy about all three choices - but I find the small Rohrschach piece especially interesting. Typical Rohrschach Test-style, everybody sees something different in it, which can make for a great conversation when friends are over. So, yes, a bit of dissecting and analyzing after all... but in a fun way! In friendly cooperation with JUNIQE.